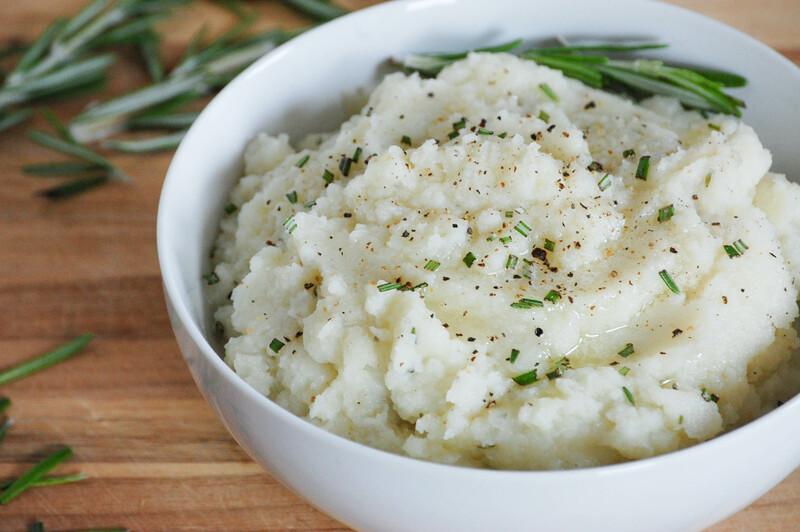 Did you know that when prepared correctly, mashed cauliflower has a very similar texture to mashed potatoes and a sweet and buttery taste? Most kids won’t flinch at the difference, and you can rest happy knowing you are squeezing in extra protein and nutrients. Top with melted cheese, and even the most adamant of veggie haters will give it a try. I love potatoes, but they are one of the most-consumed foods in the US and most of us are getting way to many of them (fries anyone?). White potatoes are tasty and have some nutritional benefits, but are nothing compared to this nutritious substitute: cauliflower! This cauliflower mashed potatoes recipe (or fauxtatoes as I like to call it) is a great side dish for Thanksgiving or other holidays, or for a healthy family dinner any night of the week. In fact, this is one substitute that I think actually tastes better than the original recipe and there are endless ways to customize it! If you have really picky eaters in your house, whip really well, and provide toppings like bacon and cheese- they won’t know the difference! You’ll love that you are serving a healthy vegetable, and they’ll love their “potatoes.” In fact, a friend recently made these for her husband and he asked if she had added cheese or extra butter to the mashed potatoes because they tasted a little different. Yet, he didn’t realize it was actually cauliflower! Use immersion blender or hand mixer to blend until smooth and creamy. This is the most important step… chunks of cauliflower are a giveaway!